If there’s anything that stands out about Oracle Cloud Products it’s the consistency of data architecture across cloud applications and the seamlessness of data visibility across business lines. Oracle’s leadership across Software-as-a-Service (SaaS) applications continues in dozens of other analyst reports, including HCM and customer experience, and it has always been our belief that, taken together, Oracle provides a leading suite of applications to run any size business in the cloud. And the trend extends beyond SCM to all of enterprise resource planning. Gartner recently released its first Magic Quadrant for Cloud ERP for Product-Centric Midsize Enterprises, and we’re pleased to announce that Oracle ERP Cloud is the only ERP (on-premises or cloud) positioned in the “Leaders” quadrant of this report. We’re making the full report available to readers, with our compliments. Gartner defines “product-centric enterprises” as those that “physically manufacture, sell and/or distribute products, and thus “are typically either manufacturing companies or distribution companies.” As a result, Gartner analysts reviewed product-centric cloud ERP suites with some or all of the following: supply chain—and manufacturing—related functionality, financial management functionality, basic purchasing functionality, and human capital management (HCM) functionality. 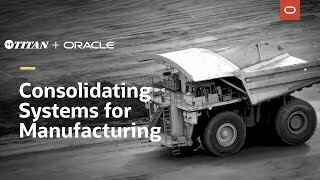 An example of a customer using multiple Oracle Cloud applications—including ERP, EPM and Supply Chain—is Titan International. Titan is moving from an on-premises Infor Lawson implementation to improve visibility across the business, reduce the cost of IT, and improve financial and other controls. Gartner notes that it is mainly midsize enterprises (thos e with annual revenue of between $50 million and $1 billion) that have led adoption of public cloud ERP solutions. However, the authors expect this to change rapidly. “By 2020, nearly 60% of large enterprises with systems up for replacement will switch from traditional on-premises licenses to cloud deployments. With demand for product-centric cloud ERP expected to grow rapidly among companies of all sizes, now is an excellent time to begin evaluating the options for those companies looking to migrate off their legacy, on-premises applications. Download the Gartner Magic Quadrant for Cloud ERP for Product-Centric Midsize Enterprises.